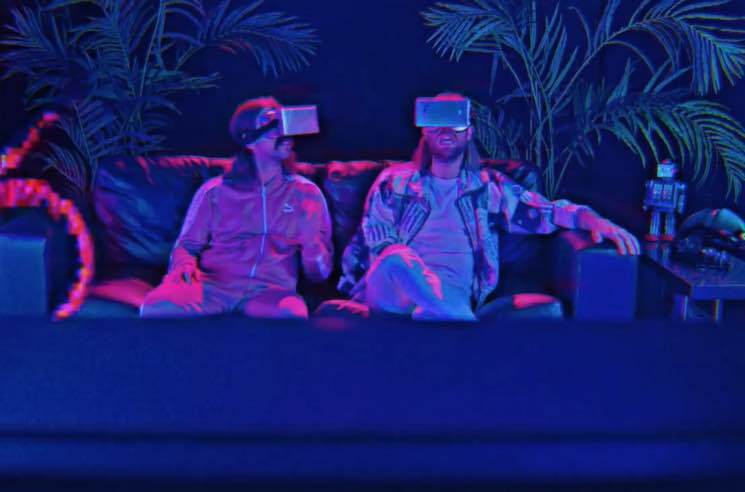 Dance-pop duo Darcys delivered their latest LP Centerfold back in 2016, but they've injected some extra life into it with a new video for album cut "Virtual Reality." The clip was directed by Amit Dabrai, and it blends the modern technology of the track's title with totally retro visuals. "'Virtual Reality' is one of the more fun songs off Centerfold, so it's fitting that it has such a wild and crazy video," the band's Wes Marskell said in a statement. "Flying dolphins, cat-lasers... it's definitely a trip to watch. I'm still pretty jealous we didn't actually get to rip in that Camaro across that surreal '80s landscape." Strap in and join them on the wildly imaginative, neon-hued ride down below. ​The Darcys Team Up with July Talk's Leah Fay on "Just Here with My Friends"
Darcys "Another Log on the Fire"